The ultimate end-of-the-evening song played at dances and hops over the years has to be "Goodnite, Sweetheart, Goodnite." It's part of the oldies culture; no other song is more effective, lyrically or emotionally, at capturing a late night farewell than The Spaniels' original recording. The group's lead singer, Thornton James Hudson (nicknamed "Pookie" as a kid), came up with the lyrics ('Goodnight, sweetheart, well, it's time to go...') after his girlfriend's parents politely showed him the door one night when he had overstayed his welcome. Songwriter Calvin Carter supplied a melody, the song became a big hit, and it's been associated with bittersweet romantic sendoffs ever since. 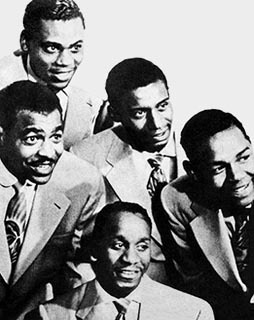 The group came together in Gary, Indiana in 1952 as The Hudsonaires with Pookie and four of his friends at Roosevelt High School: tenors Ernest Warren and Willie Jackson, baritone Opal Courtney, Jr. and bass singer Gerald Gregory (classmates nicknamed him "Bounce" because his deep voice ricocheted off school walls). Initial reaction wasn't strong; a comment by Gregory's young bride that they sounded like "a bunch of dogs" became an inside joke, so for fun they changed the group's name to the Spaniels...and it stuck. Calvin's sister Vivian Carter, a radio personality in Gary, made herself even more accessible to the public in the early '50s when she opened Vivian's Record Shop with future husband James Bracken. In 1953 the couple made the risky decision to start a record company. Blues singer Jimmy Reed, having been rejected by bigger companies, was first to sign on. Around that time Pookie and his partners showed up at the shop and auditioned. 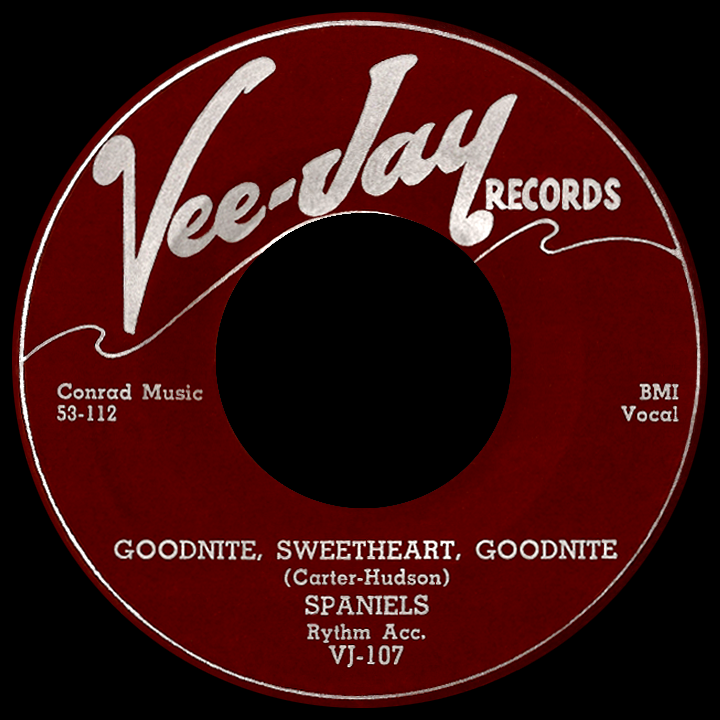 Vee-Jay Records (as in Vivian and James) launched with a single by Reed, "High and Lonesome," followed by the Spaniels' debut, "Baby It's You," a tune written by the five group members. The disc took off in Chicago, giving Vivian added pressure trying to satisfy demand; she made arrangements for wider distribution with Art Sheridan of Chance, a Chicago label that had been in business for a couple of years. After its release on Chance, the record sold well on a national level and spent two weeks in the rhythm and blues top ten in September. The group's second Vee-Jay single, "The Bells Ring Out," didn't fare as well, but the third delivered the goods. 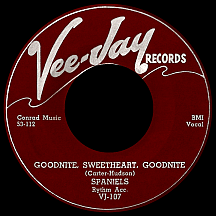 "Goodnite, Sweetheart, Goodnite" spent more than three months in the R&B top ten during the spring and summer of 1954, peaking in June aside other vocal group hits by The Spiders, The Clovers, The Crows, The Midnighters and The Four Tunes. Cover versions quickly hit the market; The McGuire Sisters gained the upper hand with their version (respelled "Goodnight, Sweetheart, Goodnight"), a top ten pop hit in August, eclipsing the impact of the Spaniels' accomplishment, though only for the short term. By the end of the year Sheridan shuttered Chance and put his resources into backing Vee-Jay, which had become profitable in a short period of time. It turned out to be a wise move, as 1955 was an explosive year for the label, with Jimmy Reed's breakthrough hit ("You Don't Have to Go") and R&B smashes by The El Dorados ("At My Front Door"), Jay McShann and Priscilla Bowman ("Hands Off") and another for the Spaniels, "You Painted Pictures." In 1956, Uncle Sam recruited two of the hitmaking dog-group-guys. Opal Courtney departed first, replaced by James Cochran (nickname: "Dimples"). Ernest Warren wasn't replaced and the group continued as a quartet. Even Hudson took his leave for a time and though Carl Rainge stepped in as lead singer, the group seemed to be falling apart. Pookie's return several months later provided stability for a few years. Keeping any kind of momentum going seemed a struggle, but in the summer of '57 they hit the charts again with "Everyone's Laughing," a nifty midtempo 'woo-oo...ha-ha, ha-ha' number. Of eleven singles it was the fourth to chart, a track record many shorter-lived doo wop groups would be envious of. There were more roster revisions between that hit and the next, "I Know," in August 1960. That hit was, oddly, the Spaniels' Vee-Jay swan song. Hudson kept going with a constantly-shifting lineup of singers, sometimes using The Imperials (Little Anthony excluded) strictly for session work, other times reuniting briefly with one or two original members, but more often hiring less-experienced singers to back him. Two releases were credited to Pookie Hudson and the Spaniels, one each on Neptune and Parkway. "I Know I Know" (a different song from the earlier "I Know") came out as a solo Pookie Hudson record on Lloyd Price's Double-L label in 1963. It bounced around the bottom region of the Billboard pop chart for several weeks from May to July of that year, gaining enough airplay on shows like Wolfman Jack's late-night, high-power Mexican border fest (which covered a large part of the U.S.) that a legion of oldies fans have reserved a special place in their hearts for that particular song. Pookie had another one-shot single on Jamie in 1966. In '69 he attempted to revive the group's most famous hit on Buddah, shortening the title to "Goodnight Sweetheart," recording with yet another set of singers but giving credit to The Spaniels (without his name up front this time). He started his own small label, North American, kicking off the new venture with a sweet-sounding ballad, "Fairy Tales," again under the Spaniels name. Calla Records picked it up for national release, landing the group back on the R&B charts, in name at least, in the summer of 1970. There were two more North American singles followed by one on the Owl label in '73 and another on Canterbury in '74, all featuring Pookie and a "who-knows-who?" assemblange of Spaniels providing backup. Many concert performances transpired. One final Pookie Hudson single, "Love Songs (On the Radio)," appeared on the obscure Tacamtra label in 1987.